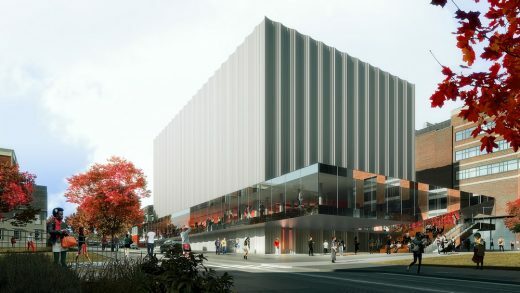 That singular flexibility, along with a horizontal “clearstory” that slices through the building’s façade at stage level, are among the signature elements of the PAC, as debuted in a set of architectural renderings and animations released by Brown and New York-based architecture firm REX on Wednesday, Feb. 13. Beyond the main hall, a suite of modern studios, rehearsal spaces and intimate performance venues will serve as everyday academic resources for students and faculty. 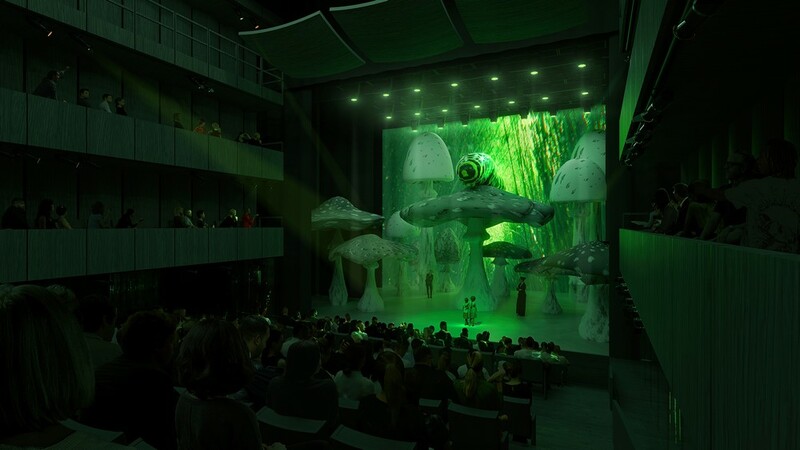 Custom-designed for theater, music and dance, the spaces aim to inspire generations of performing artists to create cutting-edge, original artwork and re-examine well-known works, practices and traditions. Joshua Ramus, founder and principal of REX, called the building both radically flexible and extremely precise. No arts space like it exists, he said. Brown unveiled initial plans for the PAC in 2017 after launching the Brown Arts Initiative (BAI), a campus-wide effort to make the University a vibrant laboratory for inventive arts practice and scholarship. Brown’s strategic plan positions the arts as an integral presence throughout the curriculum and fundamental to cultivating creative expression, stimulating discovery and fueling innovative thinking. As envisioned, the PAC will vastly expand Brown’s ability to create and stage new and existing works, combine art forms, and welcome world-renowned faculty and artists to learn from and inspire scholars across disparate fields of study. The release of the renderings follows a two-year planning, design and community engagement process and a recent vote by the Corporation of Brown University to authorize site work at the PAC’s approved location on Angell Street in Providence. The University’s target date for completion is spring 2022. 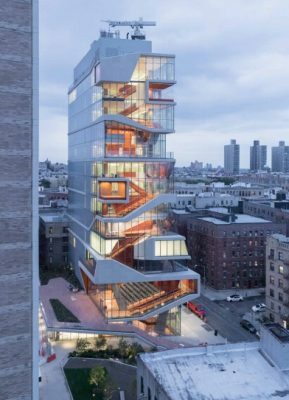 On its striking exterior, the building will be shrink-wrapped in an extruded aluminum rainscreen, composed of fractal-like fluted geometry, Ramus said. The appearance of color and pattern on the façade will shift with seasonal changes and time of day. 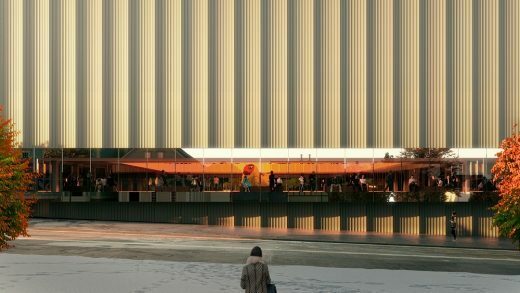 Intersecting the vertical flutes, the 13-foot horizontal clearstory slices through the building, revealing the interior of the main floor, including the main performance hall, to passersby in every direction. The glass gives those inside, particularly in the Diana Nelson and John Atwater Lobby and a south-facing promenade, expansive views of The Walk, a series of linked green spaces that intersect the Brown campus. According to Ramus, while most performance halls have fixed seats and stages intended primarily for specific art forms, Brown’s main hall will depart radically from that convention. REX designed a space in which all six surfaces of the shoebox-shaped hall can modulate physically and/or acoustically. Components such as seating gantries, acoustic curtains, reflector panels and lighting bridges can be shifted, hidden and stretched to configure the space. With the capability to move walls, floors, seats, ceiling and lights, the PAC can host a Brown University Orchestra concert, a dance recital, an interactive digital media installation, a proscenium theater performance and a formal banquet — all in the same space and all in a matter of a week or two. 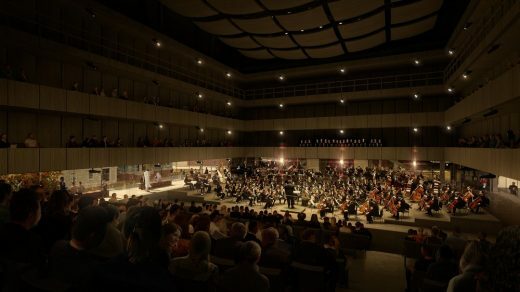 Of the five presets designed by REX, the Orchestra configuration looks most like a traditional concert hall, with a stage that accommodates a 100-piece orchestra, a choir loft with space for 80, raked seats for audiences and additional seating in two levels of balconies. The Recital configuration creates a more intimate 350-seat venue ideal for soloists, small ensembles and chamber orchestras, and the walls pushed closer together for optimal acoustics. 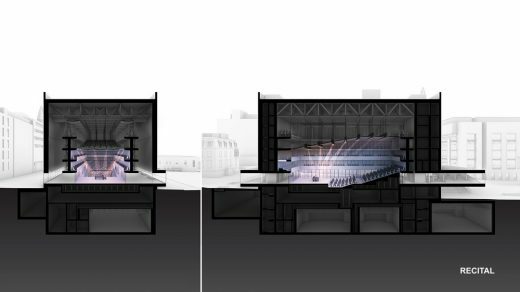 The End Stage configuration, designed with theater and dance performances in mind, raises the stage and adds wing space on either side. 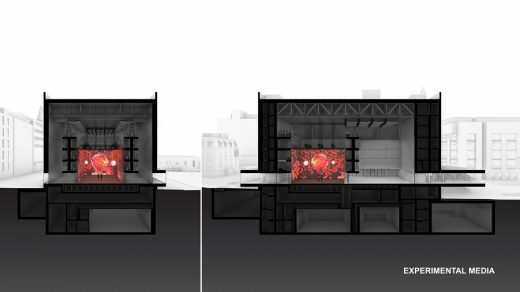 Experimental Media configures the space into a small cube and tucks the seats below the stage, creating a blank canvas ideal for projections, experimental sound installations, standing concerts or immersive art installations. And the Flat Floor configuration removes all fixed seats and stages to accommodate a wide range of events, from conferences to galas. All five configurations include access to a lighting catwalk and a control room for sound. 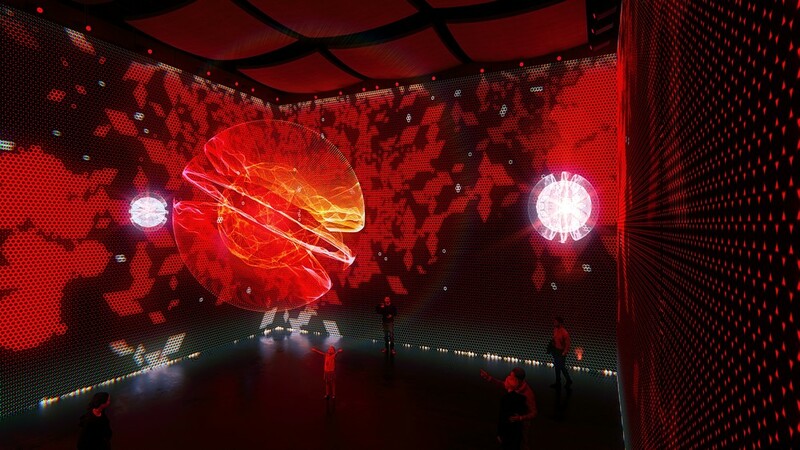 Technology will be state of the art, including professional touring-grade amplification, multi-channel ambisonic audio, immersive video projection, scenic projection and a full complement of fixed lighting. Interior glass walls will allow visibility through the main performance hall, the lobby and promenade, though light can be blocked by blackout drapes as required. Butch Rovan, a professor of music and faculty director of the BAI, said the extensive use of glass will offer insight and transparency into the fascinating, sometimes messy process of art-making. Viewed from the exterior, the clearstory projects outward beyond the building’s vertical perimeter on three sides. Outside, REX prioritized pedestrian and gathering space, creating a plaza at the base of the building’s east entrance where performers, students and the public can congregate. Most visitors will enter via amphitheater-like steps leading from the exterior ground level up into the lobby’s raised entry vestibule. 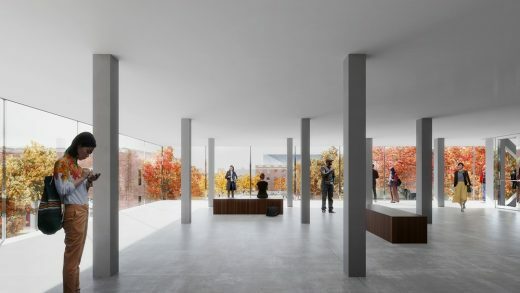 A small “tribune” space adjacent to the steps and underneath the overhang of the clearstory can be used for outdoor performances, student events and more. Below street level in the PAC, spaces for theater, music and dance will allow students and faculty to create cutting-edge, original artwork, Rovan said, and offer spaces for student groups and other collaborative endeavors. Each includes a control room and customizable performance equipment; they can function as studios, classrooms, stages or meeting spaces. The largest of the lower-level spaces was created with an orchestra in mind, with floor-length curtains around its entire perimeter for acoustic dampening. When not used for rehearsals, the space will double as an intimate 165-seat performance venue for smaller ensembles. The medium space, a dance studio, has true sprung floors, a mirror and barre along one wall and adjustable curtains. For performances, the space can seat 110. The smallest space can be used as an acting studio and black-box theater with 50 seats. Its walls and floors are made of rugged materials that can be painted, drilled into and otherwise customized to create sets. 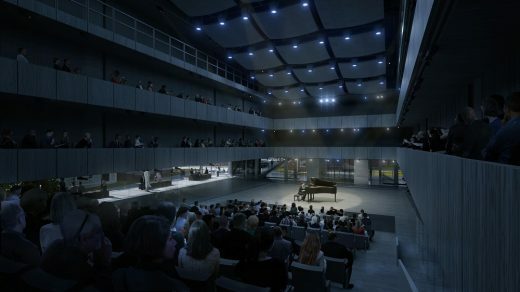 The PAC’s lower floors will also house a percussion studio and an array of small practice rooms and dressing rooms, along with space for event support, administrative offices and meetings. Rooms to store instruments and sound and lighting equipment are included as well. Ramus said that from early planning sessions, it became clear that the need for a dedicated performance space suitable for large ensembles — most notably, a venue for joint performances by Brown’s acclaimed 100-piece symphony orchestra and 80-singer chorus — would drive the size of the main hall. Yet the wide-ranging nature of performance by artists and scholars at the University demanded the ability to also host intimate events in a variety of configurations. Brown needed a space to match the ethos of the BAI, which supports all things experimental, forward-thinking and collaborative in the arts. According to the BAI’s Rovan, the malleability of the space will bring to life Brown’s vision of the arts as a catalyst for creativity, discovery and innovation. With a wide variety of cultural events open to the public throughout the year, the PAC will serve as an asset to the greater community, Rovan said. It will also be a significant new addition to the College Hill neighborhood, so the University ensured ample opportunity for community feedback from the project’s early stages. 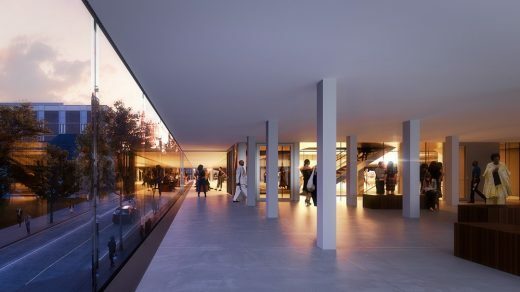 That process — which included public meetings, conversations with community groups and approvals from the City of Providence — informed the site ultimately selected for the PAC, as well as REX’s approach to designing a building that would welcome visitors and encourage interactions between those inside and outside the center. Anne Bergeron, managing director of the BAI, says the building will be an art form in its own right. The PAC — fully accessible to individuals with disabilities — will be open for gatherings before and after performances in the main hall, with the lobby designed also to accommodate events and functions. The building is envisioned as a space that will encourage informal interactions, both social and intellectual, as members of the Brown community venture through on a daily basis. 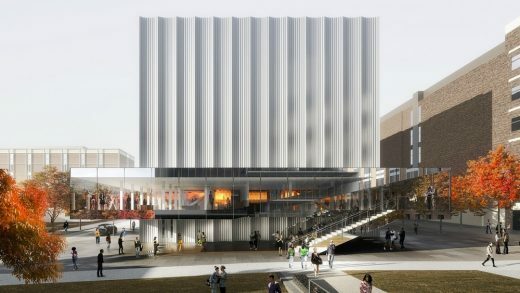 In addition to its role as a hub for performances that will welcome members of the Brown community and beyond, the PAC will serve students, faculty and staff who engage in teaching and research in the performing arts. That includes many who don’t specialize in the arts directly. Rovan explained that in a recent semester, the Brown Orchestra included students from 31 different academic concentrations, ranging from anthropology and applied math, to English and environmental studies, and music, public policy and visual arts. Rovan said the entirety of the building — from the main performance hall to the gathering spaces to the lower-level rehearsal rooms and informal performance venues — is designed to encourage the collaborative spirit for which Brown is known. 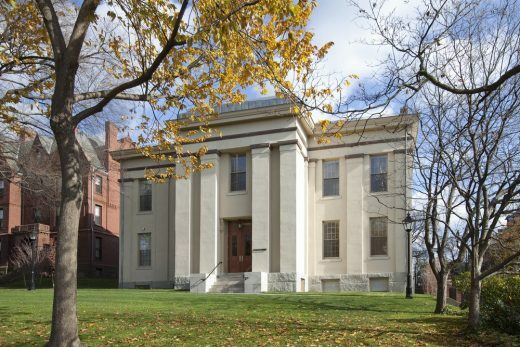 Private Ivy League research university in Providence, Rhode Island, United States, founded in 1764.